There was disappointment on both sides after VfL Wolfsburg and 1. FC Köln played out a 1-1 draw at the Volkswagen Arena on Matchday 19. The Wolves rued a missed opportunity to break into the top six, while their guests, although somewhat more satisfied with the point, also felt they could have taken more from the game. 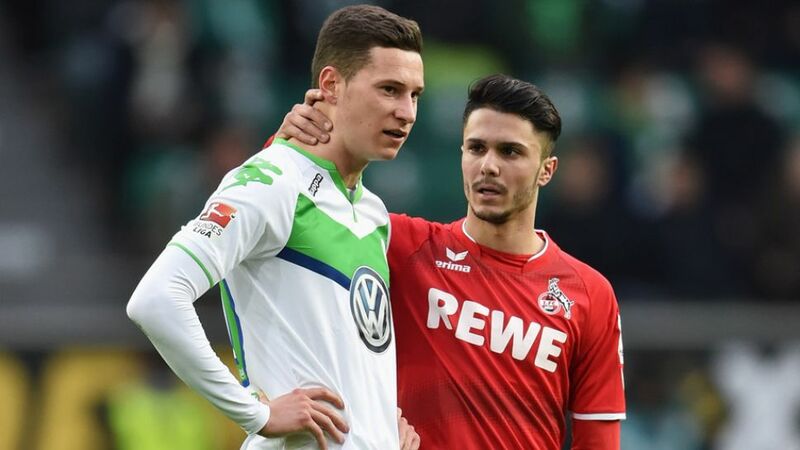 Julian Draxler (Wolfsburg midfielder): "We’re not at all satisfied today. We wanted to win the game and we couldn’t manage it - a scruffy home win would have done us good. We can play a lot better than we did today and that’s the frustrating thing. We had a few chances today that we didn’t take. We have to settle for the draw and move on. It will be a homecoming for me at Schalke next week and I’m looking forward to it." Diego Benaglio (Wolfsburg goalkeeper): "It wasn’t an easy game. They sat pretty deep and it was hard for us to create chances, and when we did manage it, we didn't take them. We led the game 1-0 again and couldn't see it out, though, and that can’t happen. It was a needless goal to concede for us. We misplaced a lot of passes, which we don't often do, but there were certainly too many occasions when we lost possession today." Dieter Hecking (Wolfsburg coach): "I'm not that happy with the result. In the first half we made far too many mistakes in possession, but we still had a few chances. After we scored the goal, we then stopped playing football and that's what I don't understand. We didn't move the ball quickly enough and we made too many errors. With the form we're in, we can't talk about [qualifying for] the Champions League right now." Klaus Allofs (Wolfsburg sporting director): "We need to show more of a goal threat. I'm sure we'll manage it – it doesn’t matter if it’s from [Andre] Schürrle or Draxler. It’s not that we’re only focusing on the bigger picture [qualifying for the Champions League] and ignoring the smaller details that we need to improve. The players are putting in the hard work but we need to keep doing it." Timo Horn (Köln goalkeeper): "I think it’s a good result but we did have a lot of chances today. They made quite a few errors in the first half and we didn’t make the most of them. In our position, a draw here is a good result, though." Yannick Gerhardt (Köln midfielder): "We all covered a lot of ground and tried to make it as hard as possible for them when they were in possession. It was a tough game but I think we might have got something more from the match. But if you take a point from a team in the last 16 of the Champions League and who as strong as they are at home, then it's a very good point." Peter Stöger (Köln coach): "I think we played pretty well today. We wouldn’t have got anything from the game if we’d not deserved it, so that’s encouraging. We had a lot of opportunities on the counter-attack that we didn’t make the most of, though. We have a squad with a lot of competition for places and we can make tactical variations when we need to. Jonas Hector is an intelligent, versatile player and he can play in a lot of positions, so we’re happy to have him." Jörg Schmadtke (Köln sporting director): "Looking at the result, you’d say a 1-1 draw here for us is a great result. But looking at the game itself, I think there might have been more in it for us. We had a few good chances that we didn’t make the most of but it was a good performance from us."